It took me a year of hearing about RMS Beauty before I finally found a physical store I could go to try it out, and what an introduction it was. Just as I planned to visit (the store in question is Bloom Beauty Lounge), I found out the store was hosting a free makeup lesson with Rose-Marie Swift, the founder of RMS Beauty. 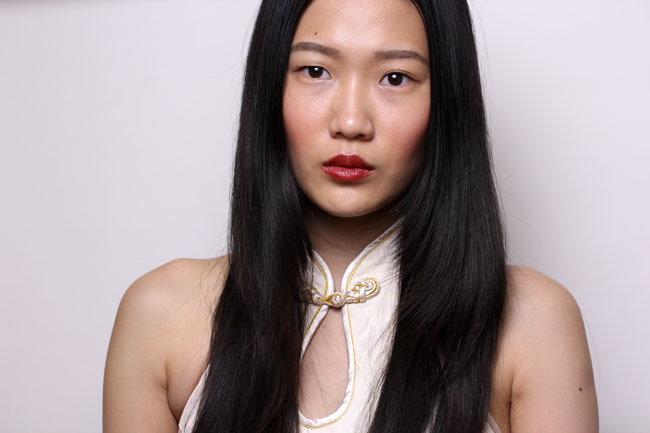 Rose-Marie Swift is unlike any makeup artist/brand owner I've ever met. It was refreshing that she didn't really have a filter to her thoughts, so we basically had two hours of uncensored insight from an industry insider. She spoke about how she fell sick years ago and couldn't find any suitable beauty products in the market that she could use, which was when she started researching on chemicals in beauty products. Appalled by what passes for "organic" and "natural" in the market (remember, FDA doesn't regulate cosmetics!) 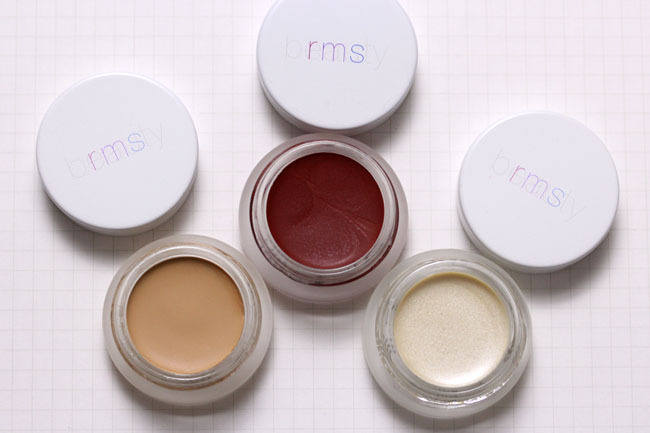 and spurred by the conspicuous lack of a truly organic line, she started her own, RMS Beauty. Now, while I appreciate a completely organic line, I'm not one to be swayed just because of it. I purchased three of her most popular products to test drive the brand. Once I started using them, it took all my restraint to not immediately go back for more. 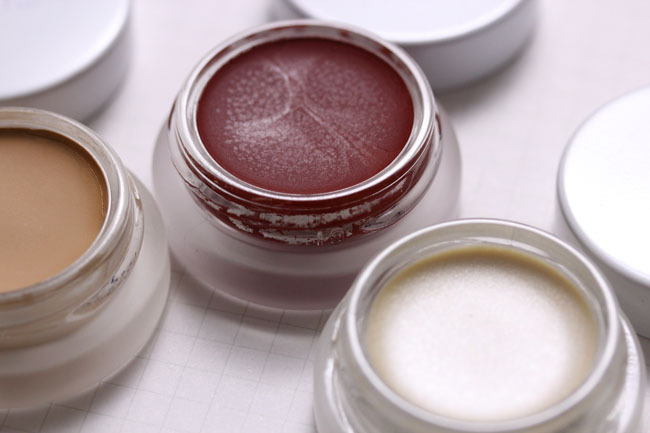 First time users need to bear in mind that the primary ingredient in RMS Beauty products is coconut oil and the texture reflects that. The "Un" Cover-Up ($36) and Lip2Cheek ($36) both have a thick consistency and feels very creamy to the touch, but once applied they blend into the skin and you'll hardly notice it's there (no matter how many layers you pile on). 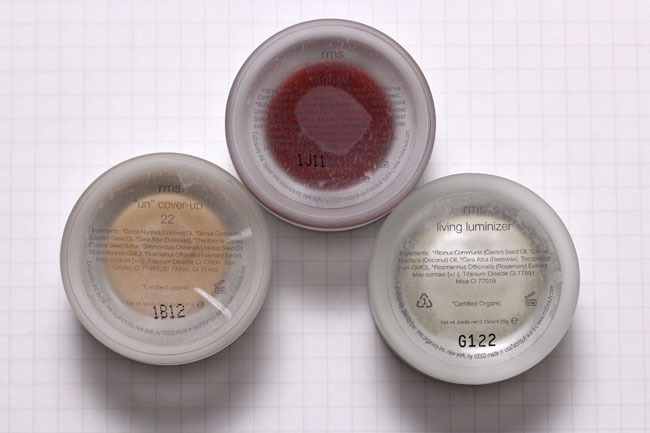 On the other hand, the Living Luminizer ($38) is lightweight and while creamy, is definitely less so compared to the other two. How do we apply them? Rose-Marie is a huge advocate of working with fingers. But before you go ew, dirty pot she assures us that her products are antimicrobial because of the lauric acid in coconut oil, as well as the lack of water in her stuff. Because of that, her products will not go bad, even though I noticed she did put a 12-month expiry sign on the box. In the pictures below, I used only the RMS Beauty products featured above (my eyebrows being the exception). 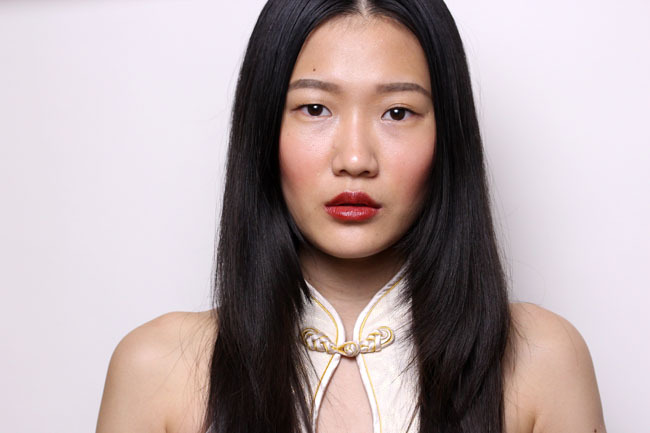 The rich brick red that is Rapture inspired the cheekiness in me to do a china doll look, complete with garb. 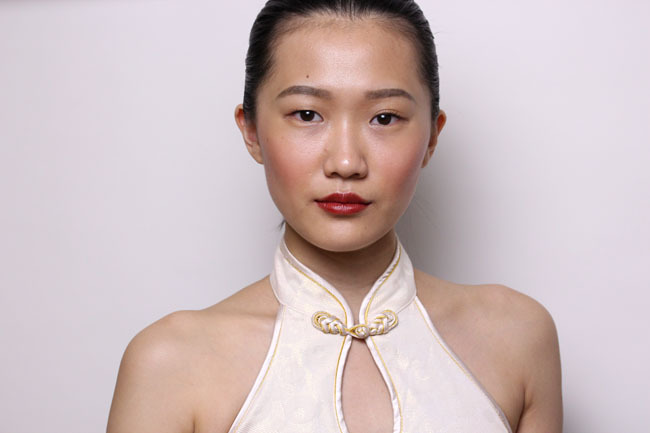 I applied three thin layers onto my lips with my fingers to build up intense color, but practiced caution when applying it to my cheeks. I used "Un" Cover-Up #22 as my concealer, applying it under my eyes, around my nose, around my mouth, and just a little on my cheeks to even out the tone. The Living Luminizer is what I've come to think of as a true highlighter. 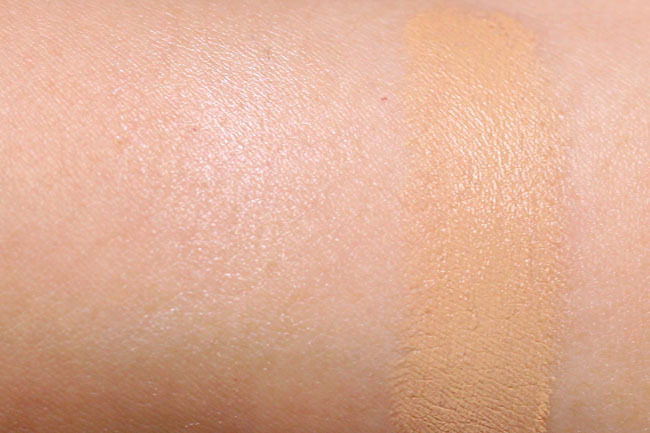 You can hardly see it in the swatch or even when applied, but in pictures it makes you glow. I placed it in the inner corners of my eyes, in the center of my eyelid, down the center of my nose, on top of my cheekbones, and on my cupid's bow. The only downside to RMS Beauty products is it's not a substitute for say, a blush that lasts for twelve hours. Rose-Marie herself said she didn't want products that will stay on all day because it scares her. It all boils down to personal chemistry. Some of her customers said they never have to reapply, while others enjoyed shorter lasting power. My experience is Rapture lasts about 5-6 hours on the cheeks and 4-5 hours on the lips if I don't eat or drink. The "Un" Cover-Up and Living Luminizer stays on a little longer, but if I touch my face it will rub off. RMS Beauty is available online at Spirit Beauty Lounge. I purchased mine from Bloom Beauty Lounge in New York City. Rose-Marie mentioned they will be introducing lipsticks in bullet form and an eyeliner to the product range soon, and she is working on a mascara with minimal amount of chemicals (just because it's impossible to make a good one without some). Sadly, she also said they will be discontinuing Rapture, which is why I snapped mine up. I've never heard of RMS makeup but the story behind it is so nice and refreshing! The owner sounds lovely and the products look really great - you can really see a difference in the way your skin looks when you're wearing the Luminizer. I tried RMS Uncover Up in 22 and 33. I wanted it to work but the shades were wrong on me. 33 has a distinct orangey-red bronze cast to it and 22 had a peachy-yellowness to it. I am glad you swatched because it ony confirmed what I did not like about it. I wish organic brands did better job of color matching more shades. Vapour Cosmetics is another awesome line but their organic line had the same color palette for fleshtones in the light-medium range. I just bought a few of their items to try during the flash sale at Cult Beauty :) But not Rapture, which makes me sad, because it looks awesome on you! Did she happen to mention if there were any other items being discontinued? 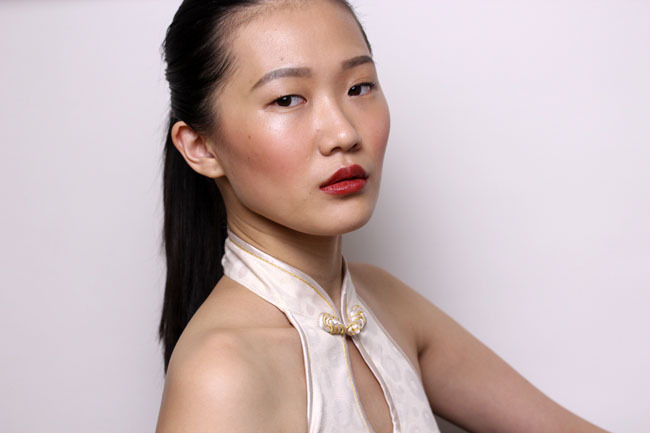 Stephanie Tang- Thanks! They're a smaller brand but have been slowly gaining recognition (Elle, Allure Awards etc.). Definitely well-known in the organic makeup world, though. fairytalesandcoffee- Rose-Marie matched the shade on me and she actually said I was in between 22 and 33, but I wore this and it somehow blends in with my skin tone. I do agree with the wishing for more shades, but maybe because they're entirely organic that they have that limitation? Claire- Yes, unfortunately. 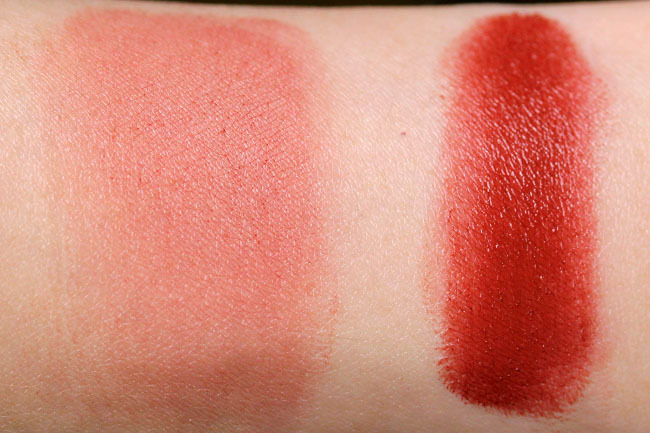 I'm looking into getting new stuff too, or just going into Bloom to swatch the entire range. Thanks for the kind words as always, Claire! Mimi- One other one, but I don't remember which it was (maybe Illusive? It was an odd color that she said women didn't go for, which made me want to go for it *immediately*). Sad I missed the sale! OMG. I want one. I WANTS ONE, PRECIOUS. These look gorgeous! I have never seen this brand anywhere near me though, and I'd love to swatch it in person...rats. We love RMS products too! You wear them gorgeously! RMS Cover girl?? I do love you in a pony! I've tried their cream eyeshadows and they do not stay on me at all even with a primer. It disappears within an hour and looks really bad. I get why she doesn't like them to last, but I find that really impractical, especially if you have skin like mine that just eats up makeup. Sorry! 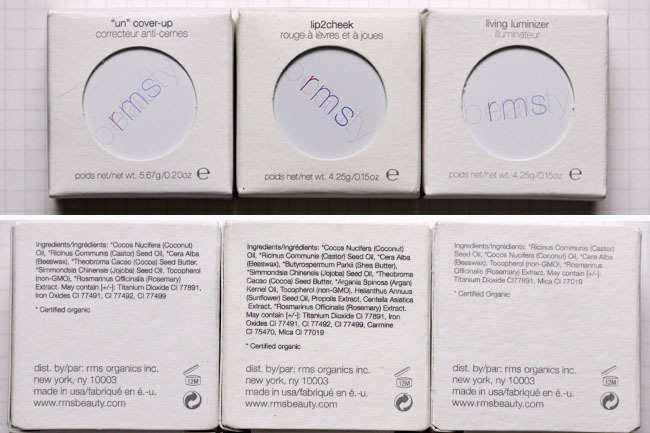 I have tried RMS's lip balm and their coconut oil (works great as an eye makeup remover!). I've wanted to try out some of their cosmetics for a long time. Rapture looks great on you! These look phenomenal on you! I am a huge RMS beauty fan, the entire lip2cheek line is great as are the lipshines - please try modest, I think you would love it! But now am gutted for Illusive if it is being discontinued as I think its the most flattering shade on my NC-NW20 skin (and lips!) - it looks like I've been out for a run in the sunshine, so natural & a bit "wind burned." You look really good, I love the look! And I can't believe Rapture is going to be discontinued.. however.. I hope she is going to come out with a better red! I think the colour Muse is going to get taken as well because its been on sale for awhile now on her website. I really want to get it, the beigy pink looks beautiful! Haha to think about it, it's weird that she's pulling of the colours illusive and rapture because they are the only two colours i have at this time and they match my skin tone!